Despite seeing several Fine-lined Emerald dragonflies (Somatochlora filosa) last Friday at Occoquan Bay National Wildlife Refuge, only this one was cooperative enough to land for a moment and allow me to get some shots. Previously I posted some photos I took of Fine-lined Emeralds in flight. I had chased and chased these elusive dragonflies, but they never seemed to stop flying. I was beginning to think that I would not get a shot of one perched when suddenly one that I was tracking dropped down into the vegetation. I approached very cautiously and spotted it clinging vertically to a narrow stem. 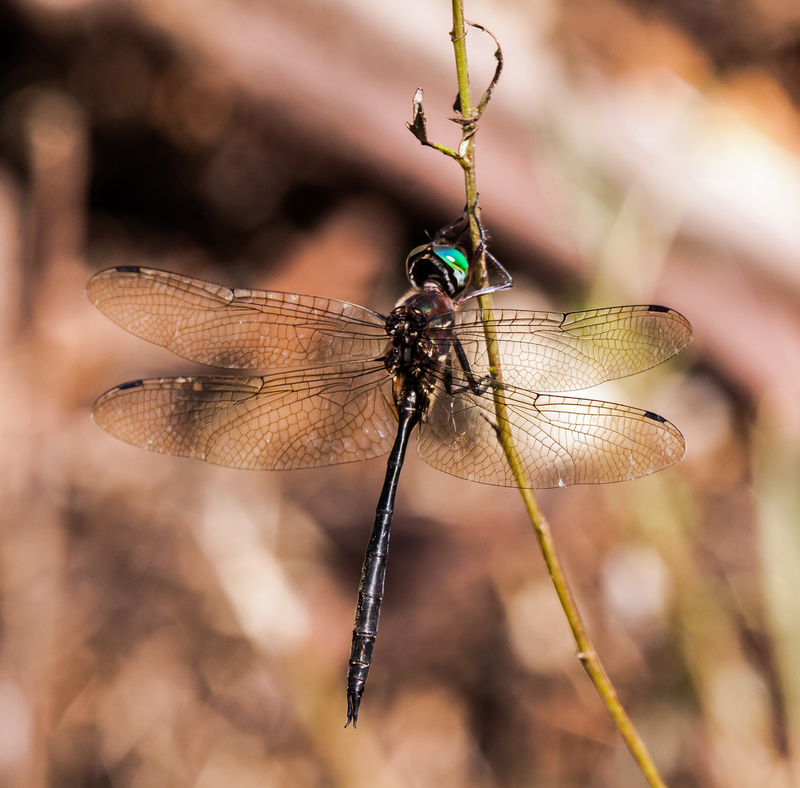 My heart was racing as I switched to manual focusing—the profile of the perched dragonfly was so slim that I didn’t think my auto-focus would lock on my subject. I took a couple of shots and then inched forward a little. This is part of an eternal struggle for a wildlife photographer, deciding how close you can get to a subject without disturbing it. I was pretty happy with this image, because I was able to capture a lot of details of this cool-looking species. I recommend clicking on the image to see a higher resolution view of the dragonfly’s spectacular emerald eyes, beautiful body markings, and wonderful wings. Very nice, some dragons take some tracking but worth it in the end. Wow! You demonstrate the rewards that patience can bring! WOW!!!!! Beautiful photo!! and the detail…..OUTSTANDING! The wing veining is always amazing in its transparency. Your persistence paid off! Great detail, Mike. Well done! Thanks, Chris. Last year I mostly chased this species with my long telephoto zoom lens. This year I used my macro lens, which helped me capture even more detail, though it forced me to be extra stealthy to try to move closer to the dragonfly. Amazing detail, Mike. That picture is so clear. I was fortunate that the dragonfly chose a to perch on a stalk of vegetation that was somewhat in the open, which meant that I was able to get a nice unobstructed shot. My macro lens can capture some incredible detail under the right conditions and this was pretty close to optimal.